The Merchant Navy Memorial, Mill Dam, South Shields. Location: Mill Dam, Customs House Centre, South Shields. Materials: Bronze and Yellow Ashlar. 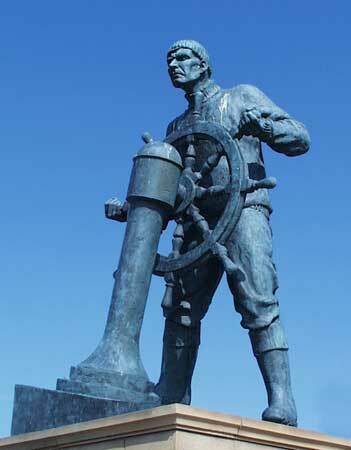 The depiction of a sailor at the wheel, on a sloping base to give the impression of what it is like to stand on a ship's deck in a choppy sea. Overlooking the Tyne he gazes keenly ahead to the dangers that may come. It was unveiled by the Duchess of Mountbatten, widow of the distinguished naval commander, Lord Louis Mountbatten.